Paw Patrol - Deluxe Lights And Sounds Plush - Real Talking Chase Just $13.31 Down From $25! You are here: Home / Great Deals / Amazon Deals / Paw Patrol – Deluxe Lights And Sounds Plush – Real Talking Chase Just $13.31 Down From $25! Paw Patrol – Deluxe Lights And Sounds Plush – Real Talking Chase Just $13.31 Down From $25! Here’s a neat Christmas gift idea! 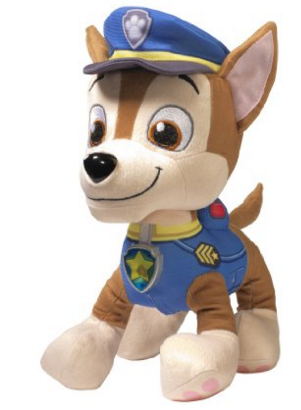 Paw Patrol – Deluxe Lights and Sounds Plush – Real Talking Chase is just $13.31 down from $25! Get yours now before it’s gone! Real Talking Chase is made from soft plush materials and is full of sounds and phrases from Paw Patrol! Give Chase’s belly a squeeze to hear him speak and watch his badge light up! Together you can go on rescue adventures full of bravery and heroism! Chase’s Police cap can be removed when it’s time for bed! Real Talking Chase is made for Paw Patrol fans ages 3+ and includes 1 LR44 battery for operation.